This 30L 12Volt rechargeable sprayer makes life so much easier, equiped with a magic wand that uses a 3 meter hose and a telescopic lance spraying your garden would have never been easier. Goldacres pride themselves on manufacturing high quality products for consumers and this electric sprayer is no different. The reliable sprayer can move 3.5L per minute and the item is UV resistant ensuring that the cosmetics and mechanics of the sprayer are built to last. This comes with a 12 month warranty. 30L tank which means that you can get more work done with less refills, ensuring your job is easier and quicker! The high quality plastic is UV resistant meaning that it is designed to work in the sun and is protected against its strong UV ray. This rechargeable 12V sprayer removes the annoying cords that get in your way and make an easier task harder than what it should be. 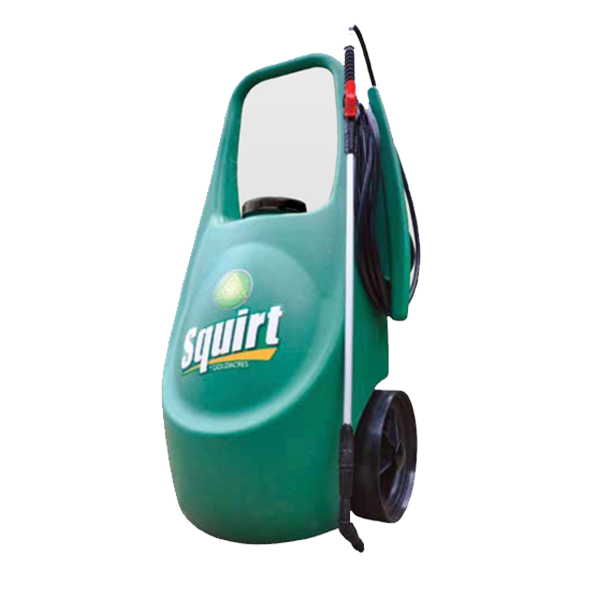 Just charge your Squirt sprayer and away you go! The telescopic lance allows you to retain a safe distance from the chemicals you are spraying so that is doesn't get on you clothing or skin. It also gives you further reach to get to areas you would otherwise miss such as under shrubs and thick trees.